SEC. 102. PAYMENTS TO STATE AND LOCAL GOVERNMENTS. excess of or less than the amounts required to be paid. government to make a contribution in order to receive Federal funds. of an entitlement period of 6 months). on which such reduction becomes final. "State and Local Government Fiscal Assistance Trust Fund"
and status of the Trust Fund during the preceding fiscal year. (B) the day after the day of enactment of this Act. ments and units of local government under this subtitle. SEC. 106. ALLOCATION AMONG STATES. sum of the amounts allocable to all States under subsection (b). amounts allocable to it under paragraph (2) and subsection (c). graph (A) for all States. on the basis of general tax effort. SEC. 107. ENTITLEMENTS OF STATE GOVERNMENTS. local government of that State as provided in section 108.
local government in such State. it transferred to units of local government. conferred on such local governments. be treated as being the one-year period beginning July 1, 1972.
graph) would be taken into account. In the case of the entitlement period beginning January 1, 1977.
for this paragraph) would be taken. into account. SEC. 108. ENTITLEMENTS OF LOCAL GOVERNMENTS. for all county areas within that State. and all other units of local government located in the county area. graph (A) for all such units. to the amount of such entitlement for such period. to reflect the amounts allocated under the preceding sentence. applicable modification under subsection (c)). divided by the population of that State. government of the county area in which such unit is located. required under paragraph (6) (D) last. with respect to units of local government. State in which it is located. on December 31,1976.] Septemb6er 30. 1980.
ing which it is to apply. (A) IN, GENERAL.-The term "iw)?t of local government"
to that unit of local government. the entirety of such unit. Census for general statistical purposes. area by the Bureau of the Census for general statistical purposes. Commerce, as the case may be. mined under paragraphs (2) and (3). ning of such entitlement period. 164(a) (3) of the Internal Revenue Code of 1954.
subsection (a)) attributed to such State for the same period..
(ii) the general tax effort factor of that State. Bureau of the Census for general statistical purposes. taxes made before the close of such period. section (a)) attributed to that county area. subsection (a)) attributed to that unit of local government. cable to expenses for education. met with respect to such taxes. the geographic area of that unit of local government. on the basis of income as defined in paragraph (3) of subsection (a). bears to the population of all the States. graph (A) for all the States. amounts of all the States. SEC. 121. REPORTS ON USE OF FUNDS; PUBLICATION. possible uses of such funds. fore the adoption of its budget as provided for under State and. unit of local government to funds made available ui nder subtitle A.
larity each item in its official budget which will be funded. the intent of this section. Se.reftj'y may prt-.wribe by regulation. 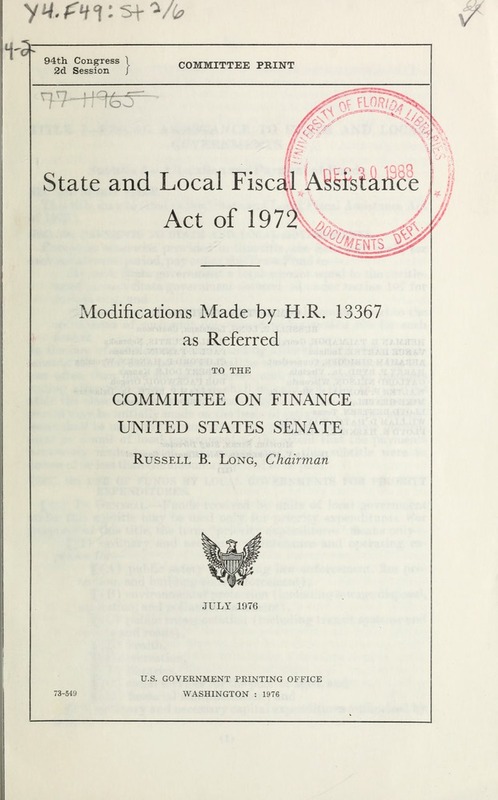 'muitoy Devdlopmnut Act of 1974 (42 U.S.C. 461). made available under subtitle A.
provided by title VI of the Civil Rights Act of 1964 (42 U.S.C. 2000d) ; or (3) to take such other action as may be provided by law. (a) (1) IN GE.VERAL.-No person shall, on account of race. color. the deferred effectiveness of such Act. directly or indirectly, with funds made available under subtitle A.
ects commenced prior to January 1, 1977.
sions of subchapter II of chapter 5, title 5, United States Code. Secretary shall send a copy thereof to each such cornp' . that the recipient is not in compliance with subsection (a) (1). compliance has not been demonstrated. .
on the merits under subparagraph (B) of this paraqrapplh. th;s title in escrow! pending the outcome of the litigation. any other Federal ci l rights. statute or regulations ,.s.,-,/ th ereu(der. graph (2) of such subsection. a ccordance with the Davis-Bacon Act, as amended (40 U.S.C. ance with Reorganization Plan Numbered 14 of 1950 (15 F.R. which funds are allocated to it under section 108 (b) (4). from the trust fund established by it under paragraph (1). graph for inspection and reproduction as public documents. to evaluate compliance aind operations under this title. ernment or unit of local gove-rnment may use. directly or infldireetly. have been paid from funds received ulnd(r subtitle A.
SEC. 124. COMPLAINTS AND COMPLIANCE REVIEWS. government for compliance with the pro;sions of this A-t.
SEC. 125. PRIVATE CIVIL ACTIONS. States district court or in a State court of general jurisdiction. pend;nq the outcome of the litigation. SEC. 141. DEFINITIONS AND SPECIAL RULES. (a) SECRETAIRY.-For purposes of this title, the term "Secretary"
(7) The one-year pi,;ods beg;nnii;g on October 1 of 1977, 1978.
ment (other than itself) within its geographic area. are not residents of the District of Columbia. tlement periods beginning on or after January 1, 1973.
forthwith be transmitted to the Attorney Genera]. been urged before the Secretary. ported by substantial evidence contained in the record..
"SEC. 6017A. PLACE OF RESIDENCE. "Sec. 6017A. Place of residence." it is shown that such failure is due to reasonable cause. collection of any penalty imposed by subsection (a) ."